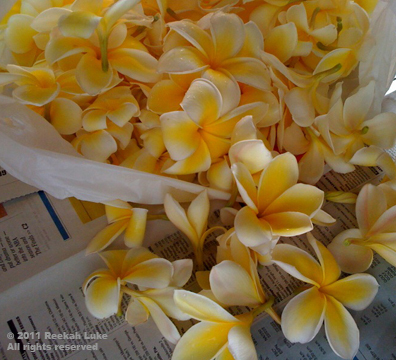 Last night’s heavy thunder storm left enough yellow plumeria on the tree outside the studio for tonight’s Punahou School commencement. I just finished picking the flowers in between the rain showers. Next I’ll be stringing the longest lei possible for my family’s deserving graduate Anna. Congratulations to the Class of 2011! And congratulations to all their parents, too!